A recipe for Granola Cake. 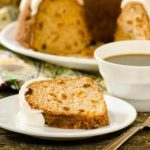 It is a moist and crumbly cake filled with golden raisins and topped with a vanilla glaze. Enjoy it any time of the day. Pour boiling water over granola and raisins in a bowl. Stir and cool to room temperature (about 1 hour). Preheat oven to 375 degrees F. Grease and flour a 10- or 12-cup bundt pan. Whisk together flour, baking powder, baking soda, salt, and nutmeg in a medium bowl. Cream butter, sugar, and brown sugar in a large bowl until light and fluffy. While blending at low speed, add flour mixture in three additions alternately with soaked granola and raisins in two additions, beginning and ending with flour mixture until just moistened. Do not over mix. Spread batter evenly in prepared pan. Bake for 40 to 50 minutes, until a toothpick or cake tester inserted in the middle comes out clean. Cool cake in the pan for 12 minutes. Turn out cake on a wire rack and cool completely. Top cake with vanilla glaze. Combine sugar, butter, vanilla, and salt in a small bowl. Gradually add milk to desired consistency. *Add 1 teaspoon of ground cinnamon to the flour mixture if using granola that is not cinnamon flavored.